My Universal I Power Test Press is having trouble with its manual/cycle controls. 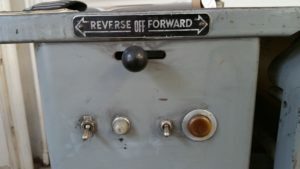 It only works in “manual” mode, so I can only move the carriage using the reverse/off/forward lever. If I move the selector switch to “cycle” and press the start button, nothing happens. Would appreciate any advice on how to fix this. Thank you! switch move to Forward position. Then use the Cycle Button. I assume you have a press fitted with an Auto delivery?